Prather’s three-year experiment, funded by the National Science Foundation, found walking sticks — herbivores which live in plants above the “litter,” or layer of dead leaves, branches and other materials on the rainforest floor — affect decomposition through their diet choices. 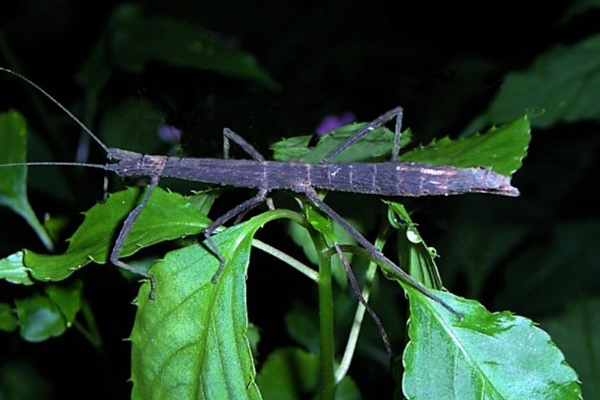 The walking sticks eat the more easily digestible spinach-like leaves and ignore the less digestible plants, which are also slower to decompose when they die and fall to the ground. That change in the makeup of the dead leaves on the forest floor affected the composition of the bacteria that decompose the litter. There was less bacteria and fewer types of them. Prather’s group, which worked in Puerto Rico, also examined snails that live in litter, but surprisingly found the snails actually living on the forest floor did not affect decomposition. The findings are important, Prather said, because ecologists previously ignored insects living above the layer of dead leaves in the forest. The study also examined if light gaps that are caused by things like treefalls due to high winds from tropical storms and hurricanes changed these animals’ effects on decomposition, but found no effect in the areas with complete canopy cover versus those whose canopy was gone. Prather says that this may just be due to how the experiment was conducted, and that in reality, a storm could enhance the effects of the walking sticks. Prather worked with Gary Belovsky from the University of Notre Dame, Sharon Cantrell-Rodriguez of the Universidad del Turabo in Puerto Rico, and Grizelle Gonzalez of the USDA Forest Service’s International Institute of Tropical Forestry. More information on the study is available at http://onlinelibrary.wiley.com/doi/10.1002/ecy.2169/abstract.